With a history of 31 years of staging annual fundraisers—in recent years as “Love Notes”—that have earned $358,000 given away to Amherst area neighbors in need, The Amherst Club has made a major impact on our community. Although the Club’s February “Love Notes” ended with the 2014 event, our fundraisers will continue without interruption in a new format. The Amherst Club’s 2015 fundraiser will be a Cabaret-style evening of festive fun in a new venue, on a new date, and now featuring an elegant dinner and preeminent entertainment, all in a single location with adjacent parking. We're embarking on an exciting new venture that can only add to our outstanding record of community service. 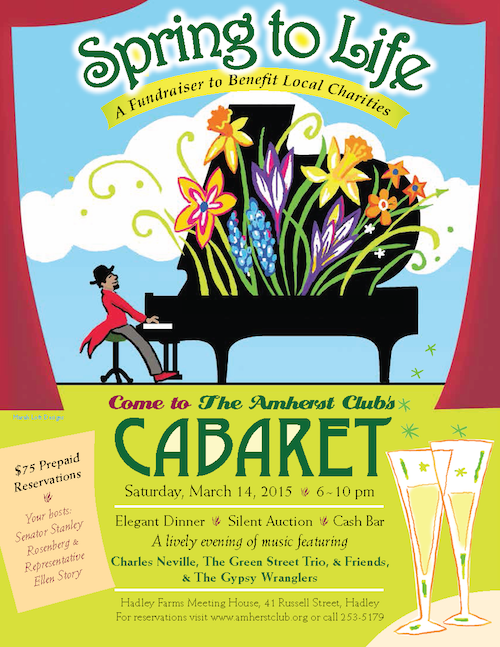 We’re counting down the weeks until "Spring to Life," the Amherst Club's new Cabaret, will take place. Member Glenn Gordon encourages other Amherst Club members and the public at large to "shake off the winter doldrums. Emerge from your hibernation and join us at a Cabaret that will bring you back to life and bring life-affirming assistance to those most in need." ➢ The venue is Hadley Farms Meeting House, located on Route 9 near where AAA and the Hadley Village Barn used to be. This is a gracious and welcoming spot with plenty of free parking and handicapped access. ➢ Dinner will be an elegantly catered buffet. ➢ Hosts will be Senator Stan Rosenberg and Representative Ellen Story. Emcee will be Amherst Club founding member and raconteur par excellence, Bill Hart. ➢ The evening will start with The Gypsy Wranglers playing while you enjoy fancy hors d'oeuvres and a cash bar. ➢ Entertainment continues with a variety of music and song to lift your spirits--all on the theme of Spring. The emphasis will be on blues and jazz standards in the tradition of the great American song book. ➢ On stage will be legendary New Orleans saxophonist Charles Neville, the Green Street Trio (with pianist Paul Arslanian, drummer Bob Weiner, bassist George Kaye) and sax man Carl Clements, vocalists Catherine Jensen-Hole and Torin Moore. ➢ A Silent Auction of valued items and gift certificates will take place in the foyer. ➢ The ticket price of $75 offers a great evening in exchange, and, more importantly, all proceeds go to local charities. However, bear in mind that space is limited to 240 seats. This means that now is the time to fill out and send in a Reservation Form (click here or on the arrow below, at right). Reservations are “first come, first served,” so mark your calendar and make your plans. You’ll be glad you did!